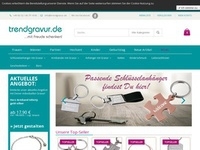 In trendgravur.de You keychains, pendants and bracelets made of stainless steel, which are provided with your desired engraving. The practical font preview shows you how your personal text will look in your favorite font. For each successful sale you get 12% of the net goods world. Brandbidding is not permitted!